Hennessy's Master Blender's Selection No 1. Jordan Bushell, Hennessy’s head of mixology and education, is sitting in a glassed-in conference room at Bloomberg in New York, batting away the suggestion that executives could dictate product development to its seventh-generation master blender, Yann Fillioux. 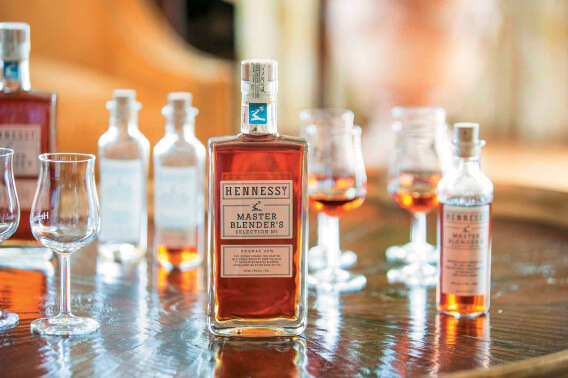 And that blend is Hennessy Master Blender’s Selection No 1 (MBS), a brand-new cognac expression officially announced on Monday. MBS was one of the most interesting new spirits I tasted this summer at the booze industry convention, Tales of the Cocktail — an unctuous, slightly sweet, slightly overproof, single-batch blend of 80 to 100 eau de vie, aged up to 16 years in two- to four-year-old Limousin oak. It was interesting, not so much for what it was (or because I was the 29th person in the world to taste it), but more for what it seemed to be attempting. I’m not a cognac connoisseur by any stretch, aside from the odd cigar-in-front-of-a-fire moment or stiff sidecar in a European bar. Brandy always seemed like a bit of a put-on to drink neat, something from another generation. And yet, you could have said that about bourbon whiskey until not too recently. According to adult beverage research firm IWSR, sales of super-premium bourbon increased 28.8% from 2011 to 2015. Meanwhile, comparable cognac sales increased 9.5%. To put a value on it, Euromonitor International reports that US$3.8 billion worth of bourbon was sold retail in the US in 2015 versus US$1.3 billion worth of cognac, a 19.1% versus 8.5% year-on-year growth respectively. Bushell, the brand mixologist, won’t go as far as to confirm that Hennessy or Fillioux specifically aimed to replicate a bourbony taste, but he admits that this is part of a strategy to capitalise on that brown spirit boom. “It’s about getting people out of that comfort zone, but in a place that they’re comfortable,” he says. It’s easy to connect the dots how MBS gets there, starting with the more biting 43% ABV; high levels of lees (residual yeasts), spice and long finish; candied apricot and almond notes; and rugged, masculine bottle shape (cognac typically comes in more curvaceous, elegant containers). The liquid itself is a bright, golden amber with plenty of viscosity, thanks to those lees. And will there be a No 2? Fillioux won’t go on record, not even to Bushell. If MBS can bridge the trend gap with whiskey-loving American drinkers, it’s easy to imagine the endeavour repeating itself, perhaps even in other global markets, with equally particular tastes. Bushell explains: “I picture this being the young urban professional that’s wanting to try new things, that maybe got introduced to single malt scotch more recently, and they want to distinguish themselves by going outside the box.